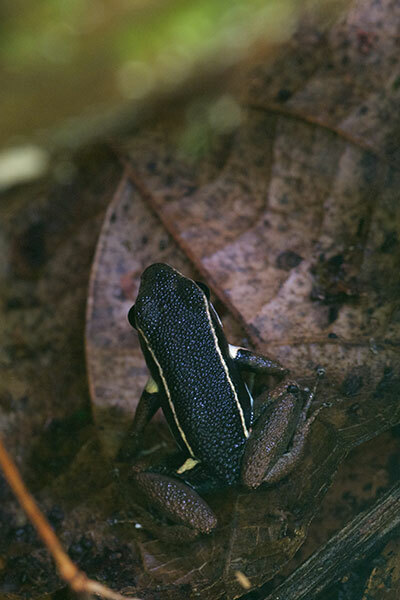 These little poison frogs, while bearing lines and spots of bright color, are very difficult to see in the leaf litter on the dark forest floor until they move. 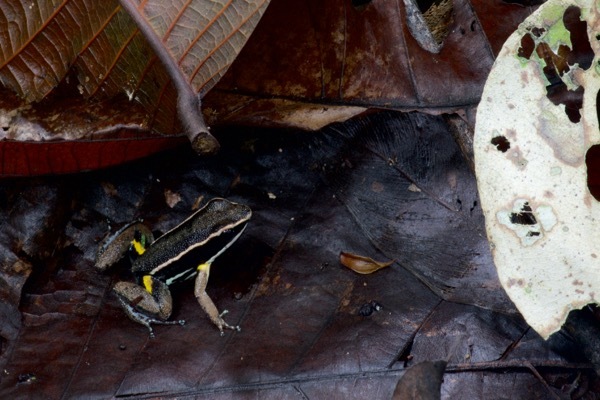 The relatively large bright yellow spot that extends over the back of each thigh is the most obvious sign that this is not the more commonly seen similar-looking species, Ameerega hahneli. In that species, a bright spot is typically present on each thigh, but it is smaller and doesn't extend to the back of the thigh. 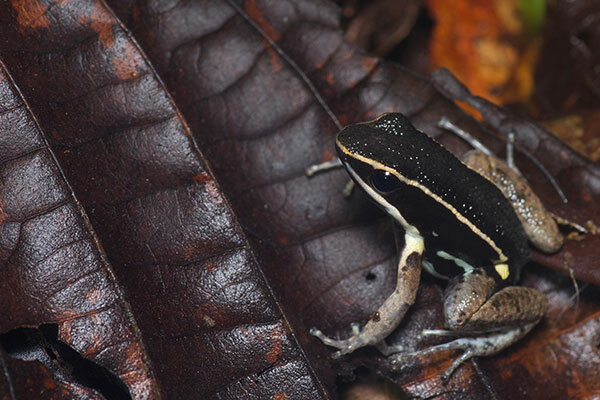 Another distinction between this species and the lookalike Ameerega hahneli is that Allobates femoralis has a light line separating the side from the belly (a "ventrolateral line") whereas A. hahneli does not. This frog is somewhat problematic in that it has a nearly-but-not-quite complete line, Or is that just a light-blue blotch that happens to be semi-linear? 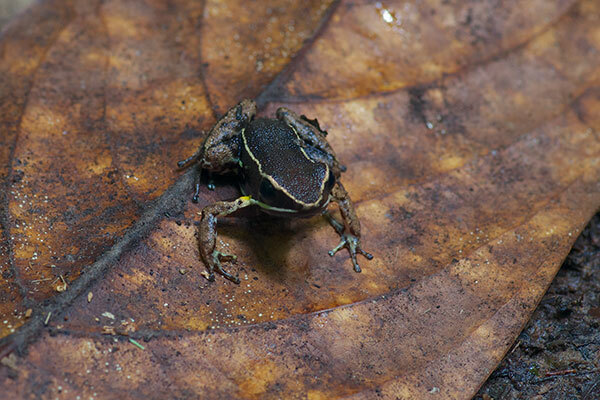 Here's another frog that lives in the morphological gray zone between the two species. The yellow thigh spots seems smallish, but there appears to be a ventrolateral line. Unless once again that's just a light blue blotch that happens to be more or less straight. 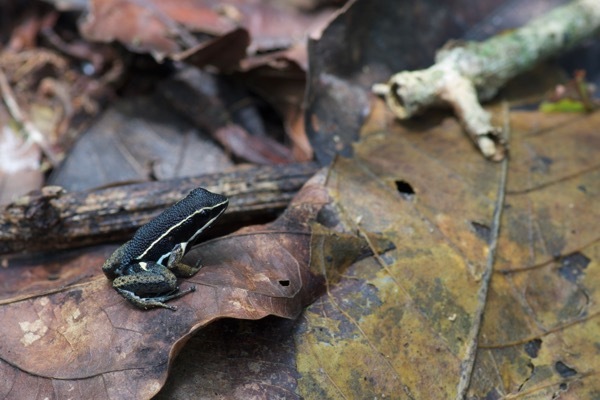 Maybe it's like Schrödinger's Frog; a DNA test would fix the identity at one of the two species, but without a DNA test it is both species at the same time? 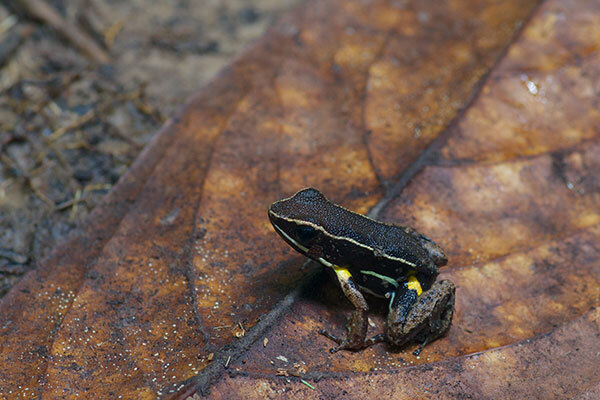 Another way to tell the species apart is to analyze the chemicals on the frog's skin. I neglected to bring my chemistry set along to Peru though. This one has nice big yellow thigh spots, and quite a straight ventrolateral line. It's just got to be Allobates femoralis, right? Right? Anyone? Bueller?